This'll be quick as I'm sitting in some dodgy motel room in Wellington, in the dark, with internet that is hamster-wheel powered. 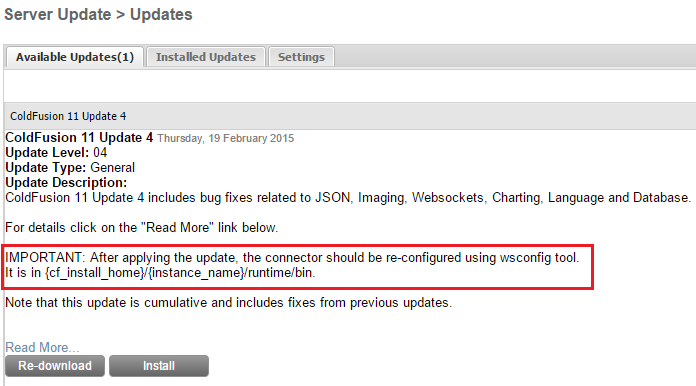 I just noticed ColdFusion 11 update 4 has finally been released. That took longer than it should have. I suspect Adobe forgot they hadn't released it. This is the one that basically fixes everything that updater 3 broke. So not exactly a forward move, but hey. At least Adam Tuttle will be pleased the ? : will be working again. It's great to see they still haven't managed to automate that step. Obviously if you install this, put it on a test machine first, and do your unit and regression tests. Do not put it straight into production. The details are here, and you install most of it via CFAdmin.